Love was on everyone’s mind this month of February, and the Motorcycle Mojo Magazine’s FaceBook community was no different. 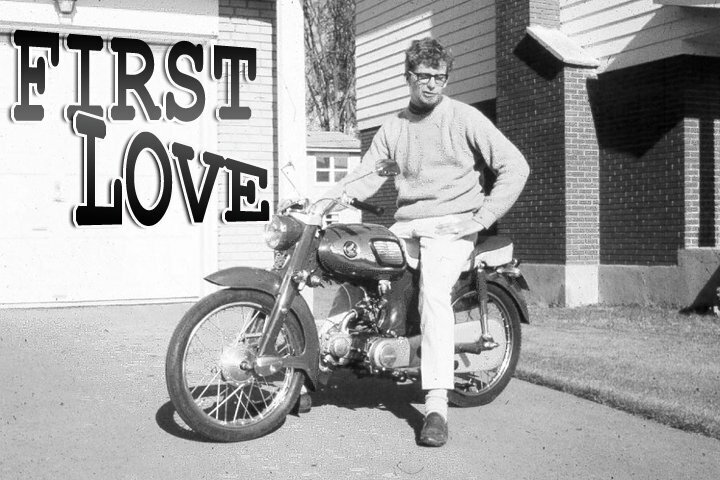 What (motorcycle) was your first love? How did you meet? Where was your first date? Mark K. When I was younger a friend of mine rode a BMW R80. I always thought a GS would be a great bike to get and when I watched Long Way Round that cemented it for me, corny I know but so it is… So after 2 V-Stroms I finally purchased my dream bike a BMW R1200 GSA. Stuart S. For me, it was a 1976 KH400, belonged to a friend who’s parents made him sell it after a close call……summer of 1979. Nowadays I don’t hold much desire to run a two stroke on the street, but back then, it was me on my Kawi against the other hooligans on their Yammi RD’s. Somehow, we all survived. Jade T. I had a string of small Yamahas and Hondas… I was young and in San Francisco and used them to commute. They were pretty easily available, and I loved them all. my fav probably was a red Yama 86 Seca. I had a ton of fun on that bike riding the hills through the fog of the city late at night. Darlene D. My first Moto love was a Yamaha Vino 50cc scoot 2 years ago. 8 months later it was a motorcycle course and them onto a 1984 Honda CM450e. My current & fave is my ’85 VT500 Shadow. Christopher G. As a newbie, I’m still riding it: a purple 1996 Honda Shadow vlx, 600cc. It’s been great for a middle-aged beginner! Peter J. That bike I’m sitting on was actually a borrowed “love”. My first was a Suzuki 80 2-stroke. One of five that I would own. The first was in 1966 when you could get a MC permit in Quebec at 16 and it was just a written and vision test. I rode EVERYWHERE! Ken C. I walked into Robinson motorcycle near my home town and of course was looking at the Nortons on display. Jim Robinson walked up and said what color do u like? I asked him if he took outboard motors in on trade and he said give me a couple days, it happened and in 69 I got a new 69 750 c.c. Norton and didn’t even know how to ride it, Jim had to deliver it to my house. What a day. Darlene D. The best thing about motorcycling is it doesn’t matter what the cc’s of the bike or age of the newb – just getting out there & doing it. Moto zen! Roni C. I met my first love while I was waiting for the results of a lump that had been removed from my breast… My husband brought her home from me. I called her Aurora, goddess of the dawn. He told me that If I thought I had nothing to live for that she should be enough to keep me going through the bad times that that I should ride her like she was stolen and never ever look back…. and how I did! R Matt Y. 1985 My 6th birthday my parents bought me a 1980 Yamaha YZ80. I raced every Sunday with my Dad. My bikes have changed, but that old yellow YZ80 was my first love! Dora D. 1987 Sportster that I had converted into a mini FL. She had amazing pipes and cornered like a dream … okay we had to weld every part back on because it shook like a son of a gun, but, that bike fit me like a glove! Noel H. I had a 1968 Norton Atlas that I got new. I wanted it because it wasn’t a Triumph. Jeff V. a ’70’s something Yamaha GT 80, wore a path in my parents lawn until I found a place to ride!! Who was yours? Enter in the comments below! Mine was a 1969 CB 450 Honda. I started on a Honda 50 “Cub”, moved up to a Honda 305 Dream, but real love came with the CB 450. I have moved on to own a Yamaha Raider and a Triumph Rocket III but there is a picture of my 1969 450 Honda on my computer. I love that story Dave. I learned on a Cub too! My own first bike was a Honda 175XL. I wish I had pictures. My first love has to be my little BW’s Yamaha scooter. When I got home from school that day (2002) and saw it there, I was excited and so was my sister. Even though I still had to wait 3 years for my license, I was still excited and got to ride it around the yard… I bought two motorcycles in 2011, a Honda CRF230 and a Ninja 650r, and I would still ride the scooter to work everyday. During fall season that year, it broke down… too expensive to fix and with two other bikes, I figured I’d let it go… Couldn’t do it, it’s still in the garage! Great story Annik. You might just have to bite the bullet and fix it up. It’s a part of you!